Presenting a tale of two football icons. One earned £20-a-week, the other more than £300,000; one advertised cigarettes, the other models his own underwear range. Blackpool-Madrid, Ford Classic-Bugatti, Communist spy partner-swimwear model girlfriend - lifestyle, earnings, fashion and clubs from different eras. These days no elite footballer is worth their salt - no pun intended - without having a nutritionist to decide whether they are overdoing it with the carbs or 7% short of their Vitamin D RDA (recommended daily allowance). Real Madrid have one, but tee-total Ronaldo was taking his diet seriously even before he signed. While at Manchester United, the Portugal forward employed his own chef to ensure he ate all the right foods. And according to the Portugal national team's chef, Luis Lavrador, his diet consists of a lot of fish - including swordfish, sea bass and bream - and other high-protein foods. The fish oils in these foods is said to improve the production of protein, which in turn increases muscle strength and enhances physical performance. Back in the 1950s, while some players were guilty of pie and chips and a pint down the Dog and Duck after a match, Matthews was something of a trailblazer. "He only drank carrot juice on Thursdays," former team-mate Jimmy Armfield told BBC Sport. "That was unusual then and it is now." The juice contains vitamins A and C, and is also supposed to improve eyesight and digestion. Matthews' daughter Jean added: "Every day his diet was the same. Carrot juice at lunch-time and steak with salad for dinner. "Every Monday he would go without any food at all because he said fasting one day a week made him feel so much better. Matthews treated remaining at peak fitness as much of a ritual as a routine - his father had been a featherweight boxer and instilled a disciplined training ethic in him. "He must have seen something in me and saw that I had to get fit," Matthews once said in an interview about his early career at Stoke. "You had to walk from Hanley to Stoke, which was two miles, come back, have your lunch and then walk back. It worked out as eight miles a day." And when he moved to Blackpool he would partake in, by today's standards, an arduous programme devised by himself, having woken up at 6am each day. "I would be back at the beach three afternoons a week after training and walk the six miles from South Shore to St Annes," he told the Stoke Sentinel. Here there are similarities with his modern counterpart Ronaldo. The Portugal international arrived as a lithe teenager, who would be knocked off the ball all too easily. But his physique and power were to undergo a remarkable transformation. "He had a plan," said former United strength and conditioning coach Mike Clegg. Ronaldo works out five days a week, doing cardio circuits and exercising his legs, arms, core. "His training emphasises explosion, endurance, speed, strength and functional movement alongside his many hours of footwork and team practices," added Clegg. Portugal's national team doctor, Antonio Gaspar, said: "I think an athlete like him can easily carry on until 33. In fact, in his case, I reckon that, barring anything untoward, he will be at the peak of his powers even longer, until 35. He's a super-athlete, way above the average in that sense." It is worth noting that Matthews' career was interrupted by the Second World War, during which he served in the Royal Air Force. The salary that Matthews earned at the start of his career would make a 14-year-old working on a paper-round weep. When he started at Stoke, the Hanley-born youngster collected £5-a-week during the season and £3-a-week during the summer. And while at Blackpool, the Wizard on the Wing had a take-home of £20-a-week as a result of the salary cap. He topped those wages with sponsorships deals, including one promoting Craven cigarettes - even though he didn't smoke - and with bonuses. That £20-a-week, according to an inflation calculator, would be worth about £682.80 in today's money. That is £35,000, which is just less than £10K above the UK average. Ironically, Matthews earned the most when he was in the twilight of his career - that was when he was 46 and went back to Stoke for £50-a-week. That is just a fraction more than Ronaldo gets paid per minute on his staggering reported £380,000-a-week wage and he tops up his income with money from his promotion of Nike, Emporio Armani, Castrol, KFC and his own underwear range. However, the £27m-a-year he earns only puts him second on the Forbes list of highest-paid athletes. Poor soul. 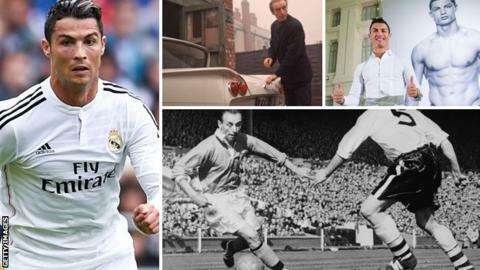 His wealth means he owns a £4.74m mansion in Madrid and car collection reported to be worth more than £80m. Matthews, on the other hand, had a Ford Classic - which was £745 for a two-door standard - and saw his days out in a quaint listed property in Stoke, believed to be worth about £500,000. Former England striker Jimmy Greaves, who remembers watching and playing with Matthews, wrote; "Let the bidding begin at £50m." He was actually worth £11,000 at the peak of his powers - the amount the Tangerines paid the Potters back in 1947. That was not the British transfer fee record, though, because in the very same year forward Tommy Lawton joined Notts County from Chelsea for £20,000. When Matthews returned to Stoke, the club paid £3,500 bringing his career transfer-fee total to £14,500. As it stands, Ronaldo's combined career total is £92m, with Real Madrid's then world record £80m outlay for him in 2009 making up the bulk of it. And how much is he worth now? "The price is that stated in his release clause - €1bn (£785m)," his agent Jorge Mendes said last year. The war - which halted English league football for seven years - perhaps curtailed the number of titles Matthews could have won. Pre-war, he helped Stoke win the Second Division title and was then part of a Blackpool side that finished second, behind Manchester United, in 1955-56. The only major trophy he won came in 1953, when he helped the Seasiders to the FA Cup during what will forever be known as the "Matthews final". It was arguably his finest among many fine moments. With 22 minutes remaining, and the side 3-1 down, Matthews led the charge, providing assists for two of the three goals that handed Blackpool a memorable win. Aside from his knighthood in 1965, Matthews twice won the Football Writers' award and also the first ever Ballon D'Or in 1956, beating Real Madrid pair Alfredo Di Stefano and Raymond Kopa to the title. As for Ronaldo, it is 11 major trophies and counting. He is also a two-time Fifa World Player of the Year, having won the title in 2008 before it merged with the Ballon D'Or in 2010. England World Cup winner Sir Bobby Charlton: "He could beat anyone. In fact, sometimes he didn't even have to beat them - they'd already beaten themselves when he started running towards them. He was just sensational." Brazil World Cup winner Pele: "Matthews taught us the way football should be played." Former Chelsea forward Gianfranco Zola: "He told me that he used to play for just 20 pounds a week. Today he would be worth all the money in the Bank of England." Former England winger Sir Tom Finney: "Stan was the greatest in my era in terms of close control." Former England manager Sir Bobby Robson: "He ranks alongside players like Pele, Maradona and Cruyff - and he was one of ours." Chelsea manager Jose Mourinho: "He is like Zinedine Zidane for the French. He is an incredible player, a goal machine. I don't need to say what everyone already knows." Ex-Manchester United manager Sir Alex Ferguson: "Cristiano was the most gifted player I managed. He surpassed all the other great ones I coached at Manchester United - and I had many." Former Manchester United winger George Best: "There have been a few players described as the new George Best over the years, but this is the first time it's been a compliment to me." Former Portugal forward and Ballon D'Or winner Eusebio: "He has magic in his boots." Former Ballon D'Or winner Luis Figo: "Ronaldo can do whatever he wants as a footballer. There are some things he does with the ball that make me touch my head and wonder how he did it." Former Ballon D'Or winner Zinedine Zidane: "He is a genius."